Genre: FPS. Other versions: Wii. It's easy to view Activision's abrupt rebirthing of GoldenEye 007 with a degree of cynicism. No doubt fishing for a bit of success by-association, this reimagining of Rare’s classic nearly fifteen years after the event plays immaculately to its nostalgia-fuelled audience. 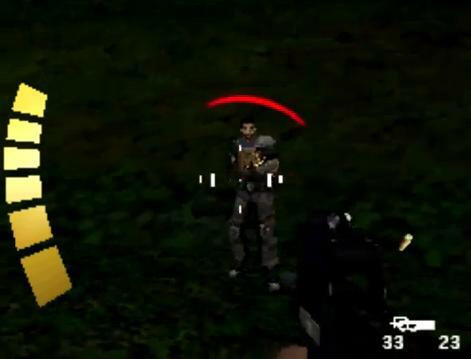 Tracing the N64 shooter’s title to the letter, 2010 GoldenEye 007 sticks closely to its famed action-FPS formula, and was even debuted exclusively on Nintendo formats at launch. The Wii edition garnered distinction thanks to an innovative control setup, but it would be unfair to judge n-Space’s DS version on either that or its nineties forerunner. Sadly however, even with realistic expectations, the handheld version comes across as a decidedly low-rent action experience. It showcases glimpses of quality, flashes of innovation and presents a solid clutch of levels, but there's no escaping the fact that it feels utterly crude to play. 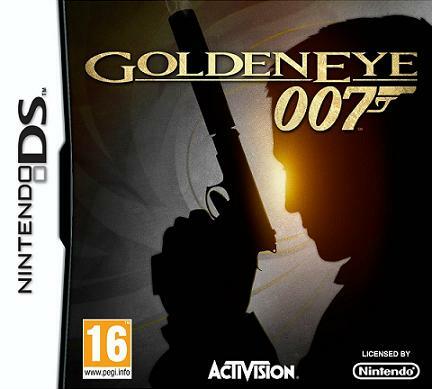 Whilst the use of the stylus as an aiming tool adds potential for a distinctive playing experience, the uncomfortable truth is that the DS version of GoldenEye 007 has a job competing with shooters fifteen years its senior, with firefights that are devoid of excitement or panache. Activision decided to update the mid-nineties narrative by swapping Pierce Brosnan for Daniel Craig, adding Smartphones and, as far as I can tell, entirely changing the likeness of every other key figure involved. Craig’s much-vaunted presence on the project is diminished by dialogues that lack any kind of sparkle, whilst femme fatale Xenia Onatopp is reborn as a disappointingly anonymous villainess who’s on your radar only briefly as you’re subjected to a miserably clunky woodland battle with her. 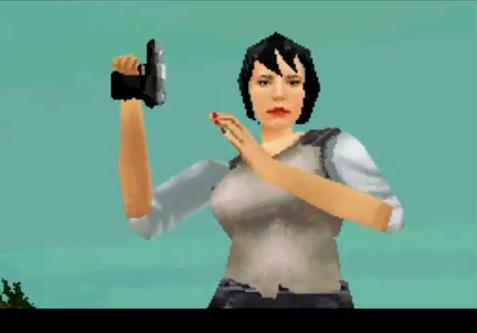 The previously-smouldering Natalya Simonova now looks like she’s been kidnapped halfway to a hen-do and, save for involving herself in obligatory ‘get shot at whilst messing with computers’ fare, her only noteworthy moment is an unfortunate (and I suspect entirely unintentional) nod to the N64 game’s glitch that sees her standing motionless staring at the wall. Oh well, at least Judy Dench is good. 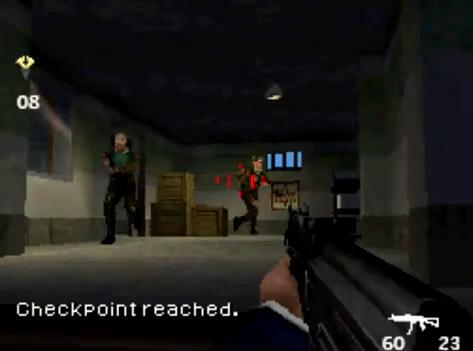 Though the Dam makes for a desperately one-dimensional opening that's little more than a dodgy shooting gallery of two-by-two enemies flooding haplessly through your crosshairs, the environs do improve as Bond is encouraged to perform certain tasks with the touch-screen; such as opening vents, swiping keycards, and entering codes. Nothing that will live long in the memory, but at least it makes some effort to accommodate the hardware. Some unexpectedly neat stealth sections give Bond licence to sneak around and employ silent takedowns with a tap of the touch-screen. Sussing out guard routes via the map is a nice touch, and there’s the occasional mini-shortcut you can take to avoid conflict, should you keep your eyes peeled. Elsewhere however, you're made all too acutely aware of the DS's hardware limitations. Whilst the use of the stylus for aiming is a cool idea, it’s a bit sluggish in practice, whilst the frame-rate completely collapses at the merest hint of activity. At low-stress, it runs alright, but in the heavier gun-fights (and by that, I mean two or more goons present), both touch-screen and buttons become criminally lethargic, as Bond takes an age to fire and tapping the reload icon is also frustratingly hit and miss. Expecting a console-quality experience would have been fool-hardy, but GoldenEye 007 struggles to keep pace with early PSone shoot ‘em ups, which for a game released in 2010, really isn’t good. Pre-empting the events of Skyfall, Bond seems prematurely old and rusty. Some of the shooting is awful, as lining up crosshairs has little bearing on where your bullets end up going, and on the odd occasion when they do find their target, there's a remarkable variance in the number of hits enemies can sustain before they fall. Sometimes it’s a couple of shots, other times you'll be left to curse an empty clip as they’re, somehow, left standing after an onslaught and you’re faced with the ignominy of Bond going through his incredibly slow and tedious reload routine. Mission design starts to get tiresome quickly despite the occasional change of pace, as too often your wanderings culminate in Bond being ambushed and left to feel hopelessly exposed by the awkward control configuration, usually accompanied by crippling bouts of slow-down. There’s only so much you can blame on hardware restraints though, as many, many DS titles have managed to balance smooth performance with dynamic visuals. 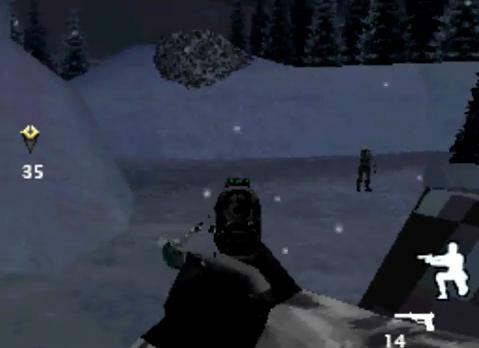 And it’s not as if GoldenEye 007 looks a million dollars anyway; sure, it features some solid interiors and ventures the odd nifty environmental effect (such as falling snow, Bond’s breath in the cold), but aside the snow levels, it’s hardly a trove of little details. It’s marred further by some comically lacklustre cut-scenes, porridgy textures and jerky animations. Some of the voicing’s good, some of its bad, and all of it carries a tinny quality. Effects may be a bit boring, but at least the music is on the money. Slow-burners add style and mystique to the tenser, sneaking levels, whilst the trademark Bond theme chimes in to compliment Bond’s actioneering nicely. Whilst not entirely hopeless, GoldenEye 007 is almost the antithesis of the technologically-pioneering N64 namesake that it tries so desperately to emulate. At times passable but more often than not awkward and riddled with performance issues, n-Space have made a valiant attempt to carve out a workable FPS, but on this evidence, it remains to be seen whether such a creation can ever sit entirely comfortably on the DS.